Pranab Mukherjee was considered close to former prime minister Indira Gandhi, who helped him get elected to the Rajya Sabha. 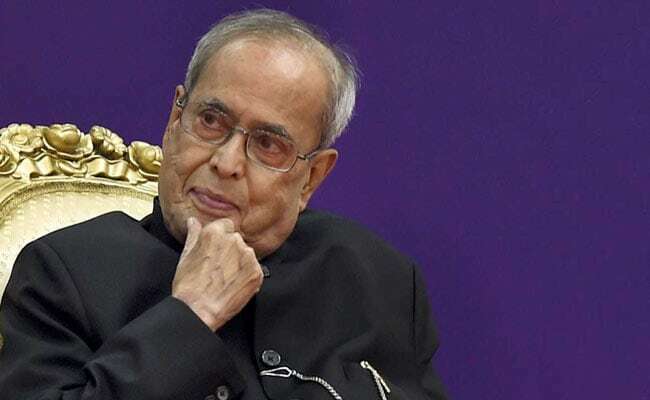 New Delhi: Former president Pranab Mukherjee has been awarded the Bharat Ratna, the country's highest civilian honour, by President Ram Nath Kovind. Along with him, social activist Nanaji Deshmukh and music maestro Bhupen Hazarika have also received the Bharat Ratna posthumously. Calling Mr Mukherjee "an outstanding statesman" PM Modi congratulated him on Twitter. Pranab Mukherjee, who was a Congress man for nearly five decades, is often known as the prime minister India never had. He held charge of top ministries including finance, external affairs and defence. Pranab Mukherjee was born in Mirati in Birbhum District of West Bengal on December 11, 1935 to freedom fighters. Mr Mukherjee's father was a Congress leader and had even been sent to jail several times for his role in India's struggle for independence. Mr Mukherjee acquired a Master's degree in History and Political Science as well as a degree in Law from the University of Calcutta. He worked as a professor and a journalist before taking the plunge into politics following his election to the Rajya Sabha in 1969. Pranab Mukherjee was considered close to former prime minister Indira Gandhi, who helped him get elected to the Rajya Sabha. He got his first ministerial post in Indira Gandhi's cabinet in 1973. He was sent to the Rajya Sabha by the Congress in 1975, 1981, 1993 and 1999. After Indira Gandhi's death in 1984, he had a fallout with the Congress leadership. He quit the party and even formed his own outfit, which was decimated in the elections. In 1991, Prime Minister PV Narasimha Rao appointed him as the deputy chairman of the Indian planning commission and subsequently as a union cabinet minister. This was the beginning of his second stint in the Congress. Owing to his good rapport with leaders of all the political parties, Pranab Mukherjee later emerged as the trouble-shooter for the Congress. He held several important portfolios in Congress governments. He was the minister for Commerce from 1993 to 1995, Minister of External Affairs from 1995 to 1996, Minister of Defence from 2004 to 2006 and once again the Minister of External Affairs from 2006 to 2009. He was the Minister of Finance from 2009 to 2012 and Leader of the Lower House of Parliament from 2004 to 2012 till he resigned to contest election to the office of the President. He assumed office as the 13th President of India on July 25, 2012. Pranab Mukherjee addressed the Rashtriya Swayamsevak Sangh cadre at the organisation's final leg of three-year training programme called the 'Tritiya Varsh Varg' in Nagpur last year which raised many eyebrows, including in his own party, the Congress. His decision to address thousands of RSS volunteers had been questioned and bemoaned by the Congress as a political gift to its opponent, the BJP, at a time when the country was being landscaped for the next general election. The RSS had said that the Congress's attack on Mr Mukherjee's participation in its event reveals its "small-mindedness". He has served on the Board of Governors of the IMF, World Bank, Asian Development Bank and African Development Bank. He has led the Indian delegations to the Commonwealth Finance Ministers' Conferences in 1982, 1983 and 1984; the United Nations General Assembly in 1994, 1995, 2005 and 2006, the Conference of Commonwealth Heads of Government at Auckland in 1995, the Non-Aligned Foreign Minister's Conference at Cartagena in 1995 and the Conference to mark the 40th anniversary of the Afro -Asian Conference in Bandung in 1995. Mr Mukherjee has authored several books on the Indian Economy and on Nation Building. Before the Bharat Ratna, the many awards and honours conferred on him include India's second highest civilian award, Padma Vibhusan in 2008, the Best Parliamentarian Award in 1997 and Best Administrator in India Award in 2011. He is recipient of Doctor of Laws Honoris Causa conferred by the University of Dhaka in 2013; and Honoris Causa conferred by the University of Calcutta in 2014 and Professor Honoris Causa conferred by the Belarus State University in 2015. He has also been awarded 5 honorary doctorates by various universities of the world. He was rated one of the best five Finance Ministers of the world in 1984 according to a survey conducted by "Euro Money" Journal published from New York and was declared 'Finance Minister of the year' for Asia in 2010 by "Emerging Markets", the journal of record for the World Bank and the IMF.